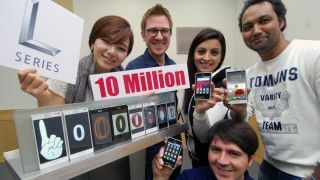 LG's L-Series range of smartphones has sold 10 million units. The Korean company sent out a press release announcing the milestone. And it makes quite interesting reading, though not for the reasons LG intended. The L-Series includes the Optimus L3, L5, L7, and L9, all of which have left us less than impressed. But still, while it might not be anywhere near the 30 million units the Samsung Galaxy S3 has sold, 10 million handsets isn't to be sniffed at. LG isn't shy about making this known. It describes the milestone as "modest", as if it was expecting to sell far more. And it takes the opportunity to have a dig at the competition. LG describes its handsets as having "distinctive" styling, not "me too". That could be a reference to the fact Samsung was sued for infringing Apple's patents. But LG didn't stop there. "This milestone demonstrates the importance of delivering smartphones with stylish design, comparative size of display and enhanced UX features," said Dr. Jong-seok Park, LG Mobile Communication Company's president and CEO. "Whereas other manufacturers are putting all their eggs into a one-size-fits-all phone, our strategy is to develop mobile products for all types of customers according to their individual needs and lifestyles." Could that be a reference to Apple's iPhone 5? It could well be.